Garmin Approach S6 Watch Black (30,000 Golf Courses World Wide!) - $349.99 - GolfersEdgeOnline.com - Best Golf Equipment On The Web! The high-resolution touch screen display incorporates the Garmin Touch Targeting feature allowing you to select any point on the display, for a precise distance to that spot. PinPointer offers you the assistance on blind shots by providing an arrow pointing directly to the green. With this feature, you will know where to hit your shot whether you can see the green or not. The addition of new features like Swing Strength, Swing Tempo and TempoTrainer allow the S6 GPS to function as a training aid to help fine-tune your timing. The Smart Notification feature lets you pair your iPhone 4S or newer version iPhone to the S6 GPS Watch enabling you to receive texts, alerts and emails. 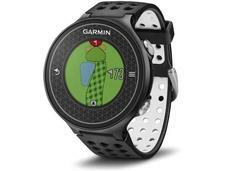 If you have any more questions about the Garmin Approach S6 Watch Black (30,000 Golf Courses World Wide! ); do not see the model you are looking for; need custom options; or prefer to not purchase online, then please call us at (630) 656-1291.